Buying small power equipment doesn’t mean you have to settle for something that’s cheaply made. Honda’s FG110 Mini Tiller is small enough for cleaning up between rows and creating beds in small areas, and its compact 4-stroke engine makes it reliable and easier to use than two-stroke models. Add some accessories, and you can put it to work for a variety of lawn and garden care tasks, making it a useful addition for anyone whether they have a green thumb or a brown one. The FG110 is powered by a GX25 mini 4-stroke engine. Designed as a direct replacement for small two-stroke motors, it has oil baffles that allow it to be operated or stored in any position. A tube steel guard protects the engine on all sides and makes it easy to lean the tiller over for transport or maintenance. This engine was primarily designed to reduce emissions, but it also comes with some major benefits for owners. Unlike a two-stroke, it doesn’t bog down as easily, it isn’t hard to start, it doesn’t need its fuel mixed with oil. It’s also far less prone to fuel sensitivity: current two-stroke engines need their fuel replaced after a month, while fuel treated with a stabilizer can be left in the GX25’s tank for up to three months. Best of all, these improvements add little in the way of weight: at just under 29 lbs, this model is about average for the segment. 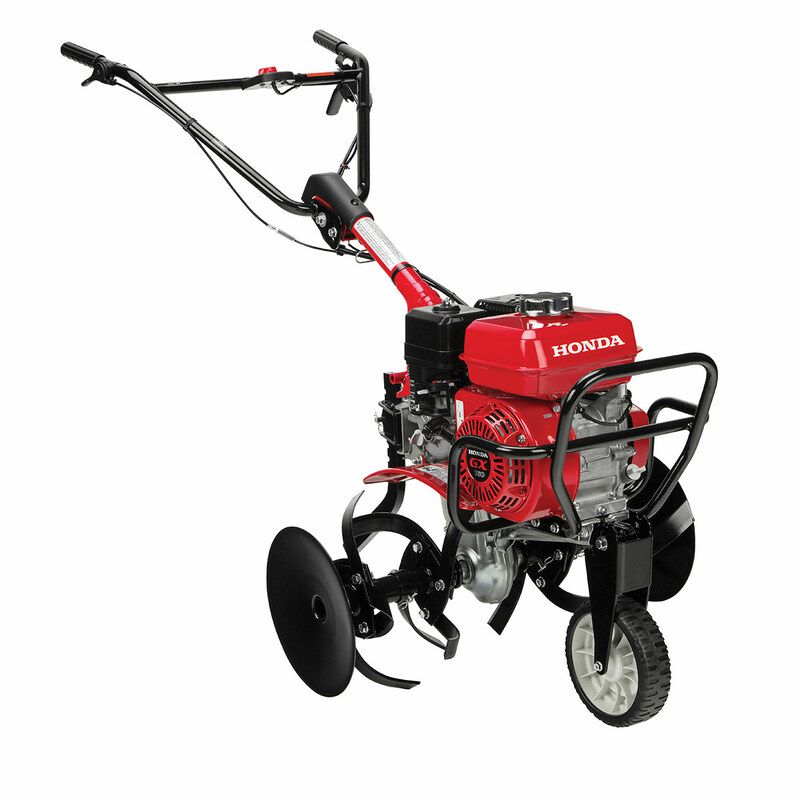 This tiller comes fitted with 8-inch diameter tines that have a maximum tilling width of 9 inches. The tines mount to the reel shaft with Clevis pins. With the outer tines removed, the cutting width is just 6 inches, letting the FG110 get into the smallest spaces. With or without all tines installed, they can spin up to 294 RPM. This tiller also comes with a couple features rarely seen on models at this end of the market. An adjustable depth bar limits how deep the tines can dig so surface weeds can be removed without cutting into the roots of the plants you want to keep. This model also doesn’t need to be carried around thanks to standard transport wheels. Aerator — Breaks up compacted soil for better drainage and root penetration. Edger — Trims plants in hard-to-reach areas next to buildings, fences, and other landscape features. Digging tines — Cuts into soil that hasn’t previously been turned. This model is covered for one year of commercial or rental use. For residential users, the FG110 is covered for two years, and the tines are guaranteed by a limited lifetime warranty. When you need something for a Honda small engine or Honda power equipment, visit www.hondalawnparts.com. As a certified dealer, we’re able to offer OEM replacement parts and accessories that can be shipped to any address in the U.S. or Canada. Finding the right part is easy: just select your model, and our site will show you exploded parts diagrams and descriptions straight from the factory. 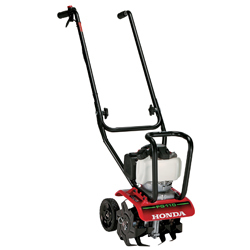 Are you looking for a tiller with maximum power and Honda reliability? The FCR800 is the top model in the company’s lineup, combining a hard-digging rear tine design, large motor and multi-speed drive system to tackle jobs big and small. This tiller is powered by a GX240. From its ball bearing supported crankshaft to its digitally controlled ignition coil, everything on this motor is designed for commercial use with minimal noise, emissions and maintenance. Tilling is dusty work, so Honda fits the FRC800’s engine with a cyclone filter. As air enters the intake, it’s accelerated through three cyclone chambers that force particulates out of the air stream. This pre-cleaning leaves less material for the air filter elements to trap, increasing filter life while cutting filter maintenance in half. A full tine enclosure with side tine shields and a full-width rear shield keeps dirt from being tossed onto adjoining plants and pavement and prevents stray stones from being launched into windows or at the operator. The transmission has three forward speeds and one reverse speed. Both gear and tine engagement are integrated into the shifter. The tines can be engaged in first gear at 0.4 mph or second gear at 0.9 mph. Since the tines always move at the same speed, going slower gives them more time to break up the soil, making first gear a great choice for breaking up unturned turf and compacted clay. Third gear is designed for transport, moving the tiller at up to 2.9 mph. Likewise, the tines shut off when in reverse, making it easy to pull the tiller out if it gets stuck. To make maintenance easier, the transmission uses the same oil as the engine. The FRC800 uses a loop handle that lets the operator use the controls while directly behind or to the left or right of the machine. No matter the position, both the engagement bail and shifter are within easy reach. The handlebar can be set to one of four height positions, letting operators of all sizes maintain a comfortable hand position. Getting the right tilling depth is easy thanks to an adjustable depth bar. Once set, it limits how deep the tines can go, letting it work as well removing surface weeds or digging up topsoil to create new planting beds. A reverse lockout keeps tines from engaging when rolling backward no matter what gear the transmission is in. Steel tubing at the front of the machine shields the engine from impacts when working in tight quarters. When you need parts for your tiller or anything else from Honda’s small equipment line, visit www.hondalawnparts.com. As a certified dealer for both Honda Power Equipment and Honda Engines, we’re able to ship OEM parts for the FRC800 across the U.S. and Canada. Need help with finding the right part? Our site can show you parts for your specific model along with factory diagrams and descriptions so you know you’re ordering exactly what you need. Most tiller models are built for very light work with minimal power and features, or for turning large areas into seed beds for gardening. If you need something that can do both, the Honda FC600 may be what you’re looking for. It’s small enough for tilling between planted rows, but its feature-packed tine system and commercial engine make it suitable for creating new beds. This tiller is powered by a GX160. A staple of commercial outdoor equipment, this compact overhead valve engine delivers reliable performance coupled with features that make it simple to use. An automatic decompression system makes pull starts easy, while Oil Alert keeps the engine from running when there isn’t enough oil to lubricate it. Everything from the aluminum pushrods to the air intake system is designed to quell noise and vibration. In this application, the GX160 produces 4.8 HP and 7.6 lb-ft. of torque. The throttle is controlled by a lever on the handle, letting the operator slow the tines when cutting through soft ground and chunky soil, then speed them up to cut through areas with compacted soil and roots. At top engine speed, the tines spin at 84 RPM. The mid-tine design puts the weight of the engine directly over the tines, helping push them into the ground, reducing the effort needed on the handles. To get a consistent digging depth, the back is fitted with a tool-free adjustment depth bar. Once digging starts, this bar skims along the top of the un-tilled surface, keeping the machine from digging deeper while letting you know by feel when the tines start lifting up out of the ground. The FC 600 has 13-inch diameter tines and a total tine width of 26 inches. The staggered design agitates as it cuts through soil, dislodging stones and breaking up compacted soil. Side discs come standard. These keep the tines from catching on fences and sidewalks and deflect dirt away from plants and pavement for easy cleanup. Need to get a seedbed ready to plant? Honda offers a furrow attachment to create uniform V-shaped trenches. Even the most careful user is bound to run into something, whether it’s a fence or a hidden rock. Up top, a large, tubular steel guard protects the front of the engine, and the handle and engine bed are reinforced to withstand bumps when getting close to trees, buildings and landscape features. Shielding around the tine seal shaft as well as axle protection prevents damage from stones tossed up by the tines. The FC 600’s handle can be set to one of three positions, helping the operator maintain a comfortable hand position regardless of height. They’re long enough to provide ample leverage, so it just takes a little pressure to force the tines into the soil. When the work is done, there’s no need to stoop down to keep the tines lifted off the ground. A front-mounted retractable transport wheel can be lowered into place when the tiller isn’t in use, making it easy to roll. 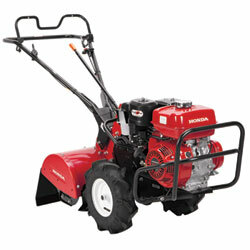 Honda guarantees this tiller and its engine for 3 years or residential or commercial use. When you need anything for your Honda power equipment or small engines, visit Hondalawnparts.com. As a certified dealer, we’re able to offer the complete line of Honda parts and accessories from air filters to furrowers. Not sure what you need? Once you select your model in our search engine, it can show you factory parts diagrams and descriptions so you can be sure you’re ordering the right part. We ship across the USA and Canada. Temperatures are warming up, and that means it will soon be time to start mowing. What do you need to do to prepare for the first mow of the season, and what do you need to do to get your grass off to a good start? A fresh tank of fuel and some clean oil will help the engine run, but when it comes to cut quality, everything is dependent on your mower’s blades. Dull blades will tear grass instead of cutting it, leaving damaged tips that are open to infection. If you’re sharpening Microcut blades, remember that the flat sides of the lower blade and the sides opposite of the wings on the upper blade do the cutting. The edge of the blade should have a continuous edge that’s as sharp as a butter knife. After sharpening, check the blade balance. If you don’t have a blade balancer, simply hang the blade on a nail. File down the side that tilts down until the blade sits evenly. If the blades are severely worn or have signs of cracking or bending, they need to be replaced. The right cutting height will depend on the grass you have on your lawn. For most turf grasses, this means waiting until it’s three inches tall, then cutting it back to two inches. Other varieties like Zenith zoysia need to be cut back once they reach one-and-a-half inches. This can take a while as the grass will grow slower while coming out of hibernation. As always, limit the cut to 1/3 of the total grass height at a time. 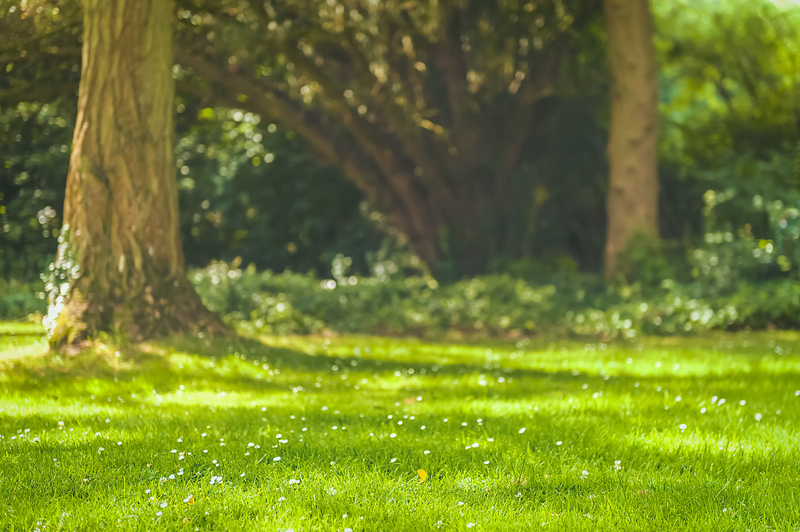 If the grass grows past the recommended height, cut part of it with the first mow, then get it to the desired height with a second mow three or more days later. Even if the grass is growing, the ground needs to be fully thawed before mowing. If there’s freezing weather in the forecast, hold off a few days to let the tuft recover. Wait for the grass to wilt a little before the first watering. This will trick the grass into thinking the weather is going to turn dry, forcing it to grow deeper roots that will help it resist heat and droughts in the summer. A thick layer of thatch can hold in moisture, causing drainage issues and mold growth. It’s good practice to take care of thatch in the fall, but problems may not show up until the spring. If this layer of material is over half an inch thick, removing it now will help the grass throughout the year. Wait until the second or third mowing to give the ground a chance to dry out and new grass to thicken up so it can withstand the action of the dethatcher. This fungus can hibernate for up to two years, blooming shortly after the grass starts growing in the spring. Infections will create circular patches of brown grass. It can be treated with a fungicide and prevented by managing thatch thickness and keeping the lawn watered during the summer. Overuse of nitrogen when fertilizing in the fall can also encourage fungus growth. Pink and gray snow mold can take hold of grass if there were heavy snowfalls early in the winter before the ground had a chance to freeze. The added moisture opens the door for the growth of this mold when temperatures rise. Like deadspot, the first signs of snow mold pop up as circular patches of brown grass. This is usually coupled with visible mold and, in severe cases, mushrooms. Snow mold starts growing once temperatures are around 30°F and keep growing until temperatures are regularly in the mid-40s for gray snow mold and as high as 60°F for pink snow mold. This mold can be killed off by helping the grass dry out. Hold off on watering and gently rake matted grass to increase exposure. Keep the grass cut to the recommended height. Fungicides are rarely necessary, but a severe infection can be stopped by applying thiophanate-methyl. Managing thatch, controlling thatch levels and spreading out snow banks can keep this mold from taking hold of your lawn. Is your mower due for a new set of blades? Have a few minor things to fix before you put it to work? www.hondalawnparts.com has everything you need to prepare for the season. Built-in parts diagrams and factory descriptions make it easy to use our search engine to find parts, and we can ship your order to any address in the United States or Canada. Admin on Power Management With A Honda Home Generator! urbain collin on Power Management With A Honda Home Generator!